BabelMap is a free character map application for Windows that allows you to browse through the entire Unicode character repertoire of over 128,000 characters, or search for a particular character by name or by code point. Characters can then be copied to the clipboard for use in any Unicode-aware application. It also provides many useful features and special utilities. BabelMap supports the most recent version of the Unicode Standard, currently Unicode 9.0 (released June 2016). These are some of the key features of BabelMap. For more information see the BabelPad Help pages (currently under construction). Browse through the entire Unicode code space block by block. 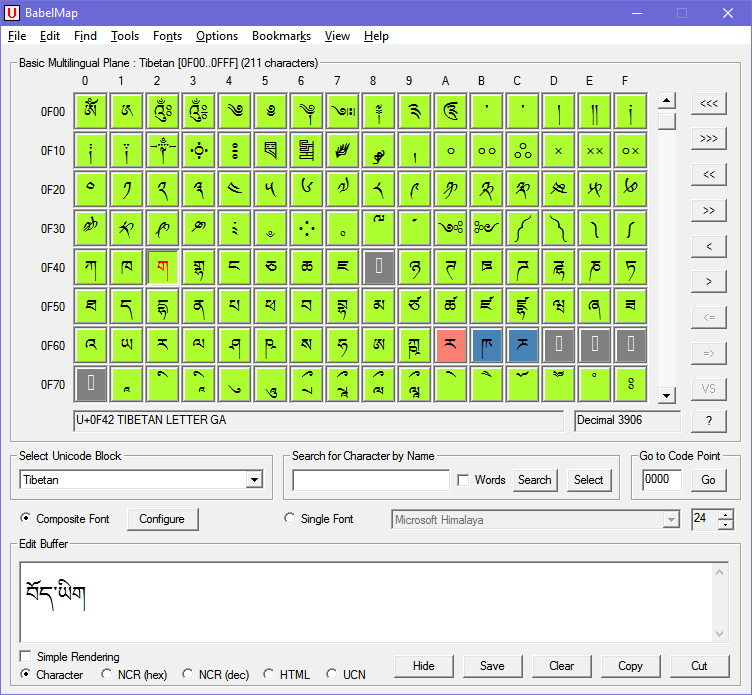 Display all characters using a single font, or define a composite font with different fonts used to display Unicode blocks. Search for any Unicode character by character name; or go to a specified code point. Paste any unknown Unicode character into the edit buffer and hit F2 to locate the character. Edit buffer supports drag-and drop editing and the user-defined composite font. Color code characters in the character grid by Unicode properties or version or script. Advanced character search utility which allows you to find all Unicode characters that match specified criteria. Character lookup tools for finding Han (CJKV) characters by radical/stroke or by Mandarin or Cantonese readings. Character lookup tool for finding Yi (Nuosu) characters by radical/stroke. Character lookup tool for finding Tangut characters by reference code. Various tools providing detailed information about Unicode versions, scripts, planes, blocks. Emoji data tool that lists data about all Unicode-defined emoji, and select single or composite emoji. Show all Unicode properties for the selected character. Show additional non-Unicode data for Han (CJKV), Tangut and Egyptian Hieroglyph characters. Show summary information for all fonts installed on your system. Show detailed information about any font on your system, including coverage of Unicode characters. Export glyphs for any font to file as images. BabelMap is free to download and use for personal or commercial purposes. However, if you do find BabelMap useful you are welcome to make a voluntary payment via PayPal (a single payment covers both BabelMap and BabelPad). BabelMap is distributed as a single executable file (no installer). Simply download the zipped file, and then unzip the file BabelMap.exe to the desired location on your computer. BabelMap runs on Windows 2000, XP, Vista, 7, 8, 8.1 and 10.